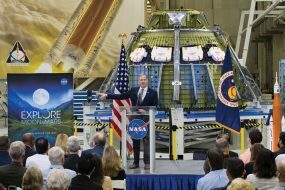 NASA and Lockheed Martin engineers have installed the largest heat shield ever constructed on the crew module of the agency’s Orion spacecraft. 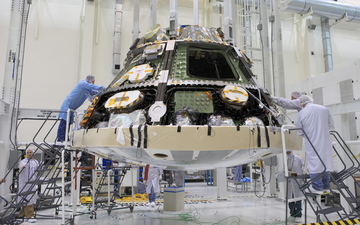 Engineers completed installing the heat shield on NASA’s Orion spacecraft ahead of its first trip to space in December. The flight test will send an uncrewed Orion 3,600 miles into space before returning it to Earth for the splashdown in the Pacific Ocean. The heat shield will help protect the Orion crew vehicle from temperatures of about 4,000 degrees Fahrenheit during its reentry into Earth’s atmosphere. NASA and Lockheed Martin engineers have installed the largest heat shield ever constructed on the crew module of the agency’s Orion spacecraft. The work marks a major milestone on the path toward the spacecraft’s first launch in December. The heat shield is made of a coating called Avcoat, which burns away as it heats up in a process called ablation to prevent the transfer of extreme temperatures to the crew module. The Avcoat is covered with a silver reflective tape that protects the material from the extreme cold temperatures of space. Orion’s flight test, or Exploration Flight Test-1, will provide engineers with data about the heat shield’s ability to protect Orion and its future crews from the 4,000-degree heat of reentry and an ocean splashdown following the spacecraft’s 20,000-mph reentry from space. Data gathered during the flight will inform decisions about design improvements on the heat shield and other Orion systems, and authenticate existing computer models and new approaches to space systems design and development. This process is critical to reducing overall risks and costs of future Orion missions — missions that will include exploring an asteroid and Mars. Orion’s flight test also will provide important data for the agency’s Space Launch System (SLS) rocket and ocean recovery of Orion. Engineers at NASA’s Marshall Space Flight Center in Huntsville, Ala., have built an advanced adapter to connect Orion to the United Launch Alliance Delta IV Heavy rocket that will launch the spacecraft during the December test. The adapter also will be used during future SLS missions. NASA’s Ground Systems Development and Operations Program, based at Kennedy Space Center in Florida, will recover the Orion crew module with the U.S. Navy after its splashdown in the Pacific Ocean. The heat shield was manufactured at Lockheed Martin’s Waterton Facility near Denver. Construction was completed at Textron Defense Systems near Boston before the heat shield was shipped to the Operations and Checkout Building at Kennedy, where Orion is being assembled. In the coming months, the Orion crew and service modules will be joined and put through functional tests before the spacecraft is transported to Kennedy’s Payload Hazardous Servicing Facility for fueling. The spacecraft then will be transferred to the Launch Abort System Facility to be connected to the LAS before making the journey to Cape Canaveral’s Space Launch Complex 37 for pad integration and launch operations.